In the world of Sarai, mass flooding has wiped out Japan. Due to an abnormal genetic trait people in this land rarely live past 16, and when they do, they become hideous monsters. Order in this world is almost non-existant. One of the last forms of protection left are the warrior maids, bodyguards for hire. They will do literally anything for the client, and are hired as protective slaves. Sarai Kannagi and her partner, Flicker, are two of these. In their adventures they fight humans-transformed-into-giant-rock monsters, hairy arctic people, and other abominations of the future barren world. Sarai had eight volumes published in English by ComicsOne from 2000 to April 4, 2005. For English readers, publication of Sarai ceased after the release of volume eight, so I am basing my review on what I have read thus far. The story places our reader in the not to distant, but quite desolate future. Modern technology has been lost, and much of humanity has died out. To make matters worse, a mutation has plagued humanity and anyone reaching the age of 16 usually morphs into a hideous monster. In this desolate land, an organization of warrior maidens, are hired by those with money and will pretty much do anything that is required of them by their client ( and I literally mean, pretty much anything ). Sarai happens to be our protagonist and the story revolves around her journey as she befriends other maidens, takes on dangerous jobs , and deals with her own inner demons. While the concept of a battling maid is not original, what gives the genre a refreshed taste is the environment that they are placed in. By giving the premises of the plot a dark feel and quite graphic scenes, the reader quickly learns that this is by far not a typical maid series. 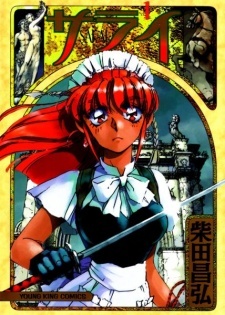 Others might argue that a maid series like Mahoromatic also has an underlying dark tone, but it is clearly a comedy series, so I like to think of Sarai as unique. The artwork itself is a little dated, anyone reading will be able to tell it has that &ldquo;90&rsquo;s anime&rdquo; feel. It&rsquo;s a little sketchy, but it has an undeniable amount of detail and very well presented. Also, if you are at all squeamish by gore, and some disturbing scenes, then this might not be a series for you. I really grew attached to the characters presented along the way. Everyone from Sarai herself as a tough, but still carrying individual, to lesser characters that only appear in certain chapters. I think in a way it stems from the fact that since the manga has dark tones and everyone is usually suffering in some way, you tend to feel sorry for them. Even in the first volume there&rsquo;s a particular character that meets her end in a terrible way and I found myself really appalled and saddened by it. Overall, it&rsquo;s the characters that really did it for me. Unfortunately, only eight volumes were published in English. Naturally, volume eight leaves you at a terrible cliffhanger. I really wish another company would release it, as it has become a personal favorite of mine. I just wanted to give my two cents on this quite unknown title and I can only hope that someday I&rsquo;ll be able to walk into a Border&rsquo;s and see it there, complete.